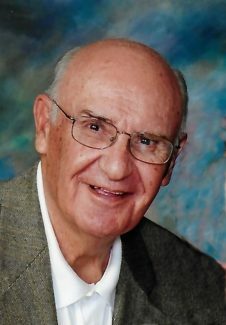 Ralph Kotich passed away on March 4, 2019, surrounded by his family. Evening prayer service was held at Bohlender Funeral Chapel on March 11. A Celebration of Life Mass was held at Saint Joseph's Catholic Church on March 12, Father Joe Hartman presiding. Ralph was born on Aug. 13, 1928, to Mary Drobnitch and Anthony Kotich on a farm near Eaton, Colo. He attended elementary school in Eaton until the family moved to Fort Collins, Colo., in 1938. In 1953, he married Marilyn D. Flagg. They were blessed with four daughters; Kim (Bill) Agnew, Diana (Michael) Gittlein, Sheri (Kris) McAuliffe, Linda (Larry) Binder, eight grandchildren, and six great-grandchildren. Ralph graduated from Fort Collins High School in 1946. He was an Honor Alumni of FCHS. He graduated from Colorado A&M with a bachelor of science degree in animal science in 1950. He was an active SAE, Livestock Club member and Livestock Judging Team member. He began his professional career with the Colorado State University Cooperative Extension Service in 1950. He served as CSU Extension Agent in Mesa, Costilla and Las Animas counties until 1961. Received a graduate degree from the University of Wisconsin in 1958. In 1961, Ralph moved his family to Fort Collins and he became the CSU Extension State Conservationist. He served in that capacity until 1972 when he became a CSU Extension District Director. In 1981, he became CSU Extension program director for Agriculture and Natural Resources. He retired in 1985 after 35 years with the Colorado State University Extension Service. During his tenure he receive many state and national professional awards, such as the USDA Superior Service Award in Washington, D.C. He was an active member of many state and national organizations, and served them in office and as a board member. He was named a fellow in the Soil Conservation Society of America. Memorial contributions may be made to the charity of your choice, The Flight of a Thousand Paper Cranes Fundraiser directed by Linda Kotich Binder, Saint Joseph Catholic Church, or CSU Animal Science Department in care of Bohlender Funeral Chapel, 121 W. Olive St., Ft. Collins, CO 80524.